The State College Spikes will be partnering with LiveSource to give fans a full array of convenient options for bidding on their charitable auctions in 2019, including the Spikes' signature theme jersey auctions. The LiveSource platform will streamline the bidding process for Spikes fans across the globe, from posting to payment to shipping. 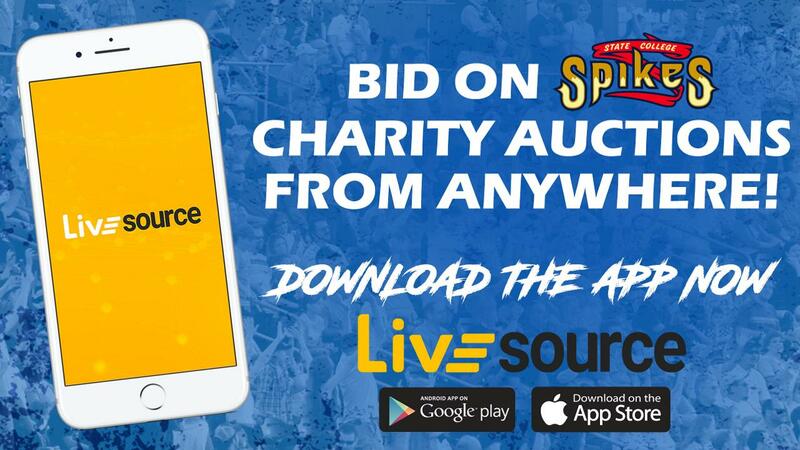 Through the easy-to-use LiveSource system, fans will have the opportunity to bid on their own personal devices and avoid crowding around bid sheets as the auction takes place. In addition, the partnership with LiveSource will open the platform to fans that may not be able to make it to the game, but still wish to place their bids in Spikes charitable auctions. More auctions will also be available throughout the year, with additional memorabilia and one-of-a-kind experiences on the block to benefit charitable organizations in Central PA.
"We are proud to partner with LiveSource to give State College Spikes fans a more convenient option for bidding on our fun, innovative theme jerseys and more memorabilia and experiences," said Spikes General Manager Scott Walker. "With this partnership, we also look forward to expanding our tradition of providing support to local charitable causes through these auctions and taking it to the next level." "The State College Spikes are one of the most respected professional baseball organizations in the country. Just ask their peers, they are top notch. We could not be more enthusiastic and excited to be in business with Mr. Walker and the entire Spikes family. LiveSource will help increase their revenue and add excitement for their fans, and we can't wait to get to work," said Scott Levin, founder and CEO of LiveSource. Fans can download the LiveSource app now for iOS and Android.